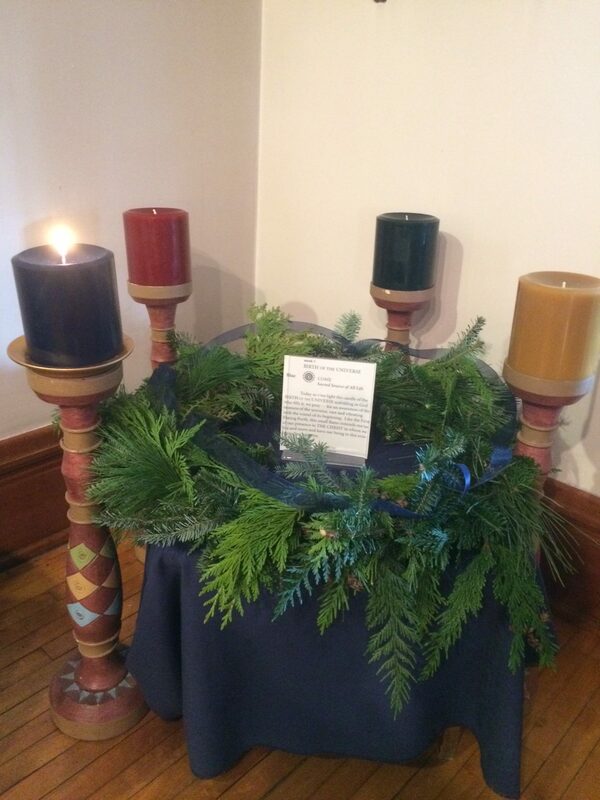 A Blessed Advent to Everyone! We have only 22 days from the first Sunday of Advent to Christmas. Each year we select a particular focus for this sacred season. In our monastic community, we are directing our thought, prayer, and planning to that time of stillness in the cave/womb that prepares us to reach out to the cosmos and “all nations” at Epiphany. Spiritually, a cave symbolizes spiritual protection, rebirth, and the invitation to something new. The cosmos beckons us to share our reborn selves with the world. For instance, especially at this time, we are called to change ourselves and support the world through Pope Francis’ encyclical letter on the environment. 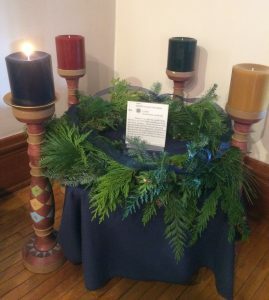 Today as we light the candle of the Birth of the Universe unfolding in God who fills it, we pray for an awareness of the oneness of the universe, vast and vibrating with the sound of its beginning. Like the First Flaring Forth, this small flame reminds us of our presence in the Christ in whom we live and move and have our being in this ever-expanding universe. Sisters Mary Frances and Brenda at morning prayer. As a sister I am often asked about prayer. “How do you pray? Do you really pray 4 times a day? What forms of prayer do you like best? What is the easiest prayer to remember? How can I teach my children to pray?” These and many other questions arise when we consider prayer. “Prayer should be the key of the day and the lock of the night.” This great quote is taped to the night stand next to my bed as a reminder. It has been a part of my personal prayer for a little over a year ago when I first discovered it on retreat with the Carmelite Sisters. There are some days when I forget to open the day with prayer and the joys and riches of that day seem out of reach for me until I become conscious of the need to unlock those delights with prayer. Similarly, if I forget to lock my day with prayer before bed I toss and turn with anxious thoughts and cares running through my mind. If I can remember to lock up the day….even if it’s 3 am …my sleep becomes restful and I am graced to wake up refreshed! watch over us as we sleep…. O! the luxury of being able to pray in a personal way as I begin a new day…by reading, journaling or just staring at the sunrise or the pine tree outside my window. Prayer is a gift for me to unlock — the gift of God’s love and care! S. Brenda shares contemplative insights on issues of social justice and advocacy. This past year, our community has been engaged in a strategic process. One of the ways in which we have felt led is to increase our awareness of and participation in social justice and advocacy. What does this mean for us as Visitation Sisters in an urban monastic setting? 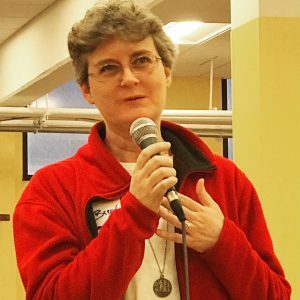 The following is Sister Brenda’s reflections on what contemplative action looks like for a community dedicated to prayer and presence in north Minneapolis. In Service Together: Easter Basket Making! 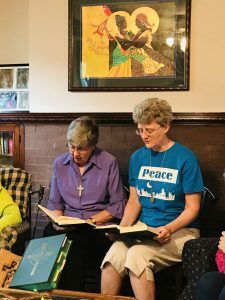 As part of the Sisters’ ministry of contemplative prayer and non-violent presence, we have a commitment to provide opportunities for pray and service alongside one another. We seek to bridge our neighborhood and suburban family and friends by participating in shared faith experiences. 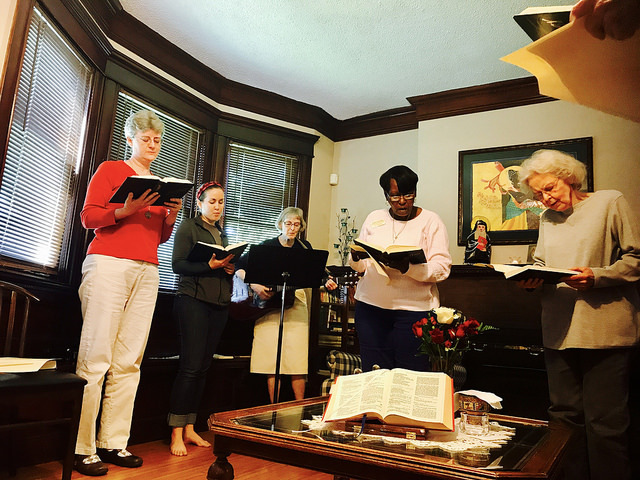 In the past weeks, leading up to Easter, the Sisters have been blessed by a few such opportunities, bringing together new families and old friends, dear members of God’s family from near and far. 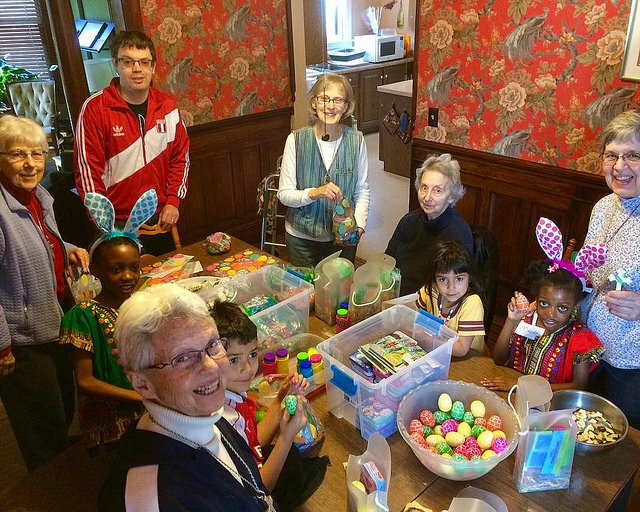 On Sunday, April 2, this bridging faith experience took place at Girard House Monastery, when northside families gathered with members from St. Thomas Beckett church in Eagan, for an annual Easter Basket exchange and prayer service. We invite you to tune into that experience of hearing the Word and breaking Bread together here. Cesar and Sylvia, children of longtime friends Derek and Adi Wood. Gathered round our table in north Minneapolis, in preparation of Holy Week, were children from Liberia; Peruvian-American babes; and our motley crew of Irish-German-European-Mexican-descendant Sisters. All members of God’s beloved family. All joined together in blessed activity. All leaning into the ways we can give back to God, in the spirit of His son. All “Living Jesus” as we are called. Can you see the joy on our faces? Can you glean our spirits in service and singing alongside one another? Blessings on one and all these Holy Days marking our sacred mysteries! Tune into our YouTube Channel to see the prayer service in full! Find all the pictures from our Easter Basket exchange with St. Thomas Beckett at Flickr. 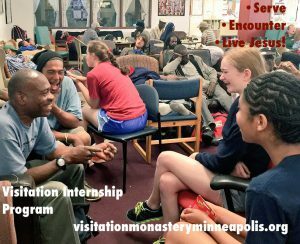 We are a community of Catholic Visitation Sisters; we have lived among poor, marginalized and oppressed persons in North Minneapolis for 27 years. Ours is a ministry of prayer and presence. The headline in the Sunday, January 22, 2017 StarTribune reads: “WE ARE HERE, WE ARE ON FIRE!” We want to give a shout out for everyone who marched and spoke out, and is prepared to give voice for those who cannot speak for themselves. Yes, we are here and we are on fire! We are in solidarity with you and promise to hold you all in prayer. The Burkinabe freedom seeker with his fist in the air. The Syrian mother lowering her babe into a boat. Pope Francis lifting the Eucharist at mass in Cuba. The police officer turning on his siren and lights just a few blocks away. The principal at my daughter’s school reaching for my kindergartner’s hand to walk her inside. A quiet woman standing before a slow moving stream. These are images that come to mind in my prayer this day. Sitting on the front porch of my Selby Avenue home in St. Paul, I hold a prayerful space alongside and for the Visitation Sisters who are on retreat this week. I’m in silent solidarity with all. No matter the distance, or circumstance, we are all bound up in this mystical body of Christ – in our common humanity, with our beating hearts, breathing bodies, seeking spirits. And it is a loving silence which unites and heals us all. – Fr. Thomas Merton Love and Living. 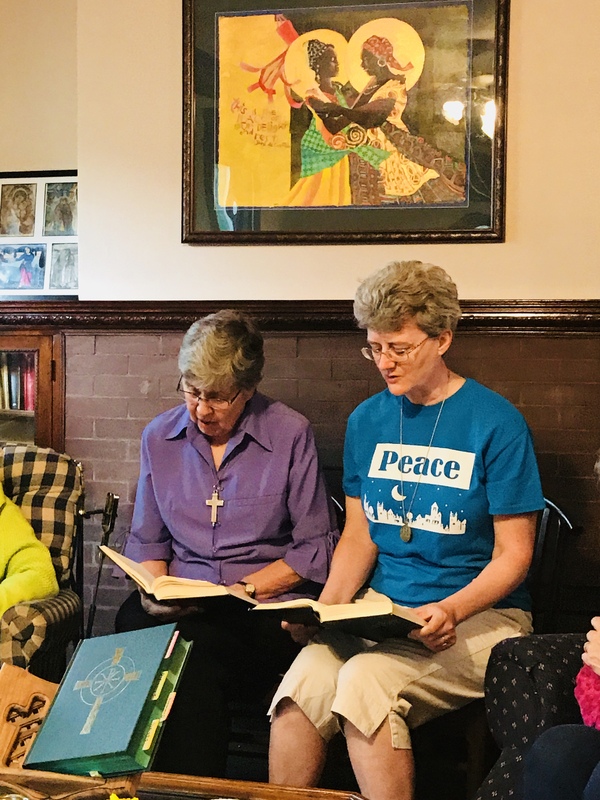 The Visitation Sisters’ community is immersed in quiet this week: on the second floor of Girard, on the back porch at Fremont; up at the ARC retreat center; over in Collegeville; lakeside at a friend’s cabin; down in Fairbault. Each sister is entering into the fullness of silence — in that echoic room of her heart where God’s voice booms, Love pierces and connects all things — and softens all stances into a compassionate embrace. In my own attempted practice of daily silence or stillness on my front porch, I have these fleeting glimpses of unity. I can travel around the world, into the darkest corners of my own neighborhood, contemplate the warring factions of humanity riddled by poverty and hunger, a desire for power, or freedom. I can see these across the river in Minneapolis, in my husband’s home country of Burkina Faso, in the headlines reporting on the Middle East, and inside my own beating heart. The silence doesn’t scare me. It’s a silence that invites me. It’s a silence that contains all the ills and joys of the world, and melds them into a wholeness, a reconciled beauty that I have few words for, save Love. 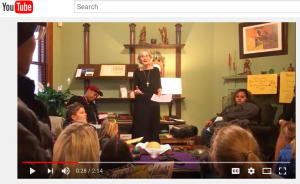 I invite you into this meditation today, into solidarity with our Sisters on retreat. 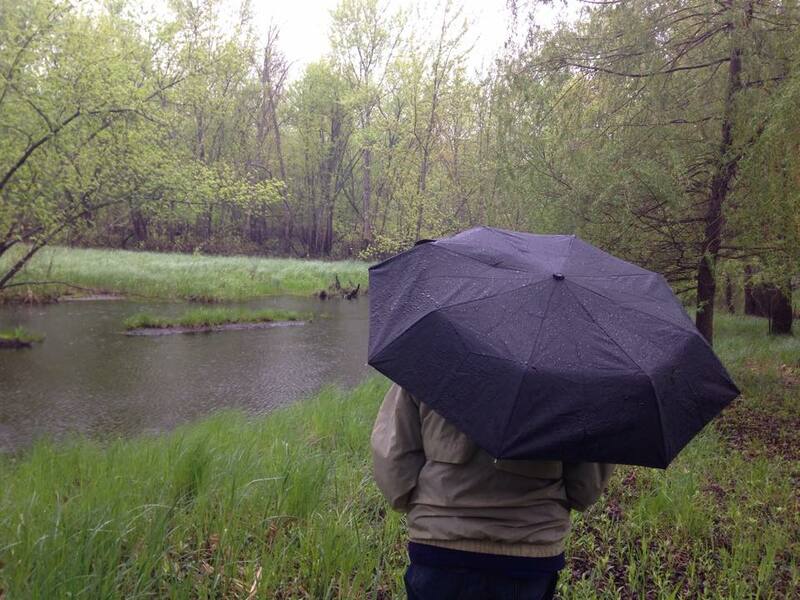 Can you carve five minutes of quiet in your day? Find a spot in your home, in your car, on your block; in your church, temple, mosque, in a park, in a space you might claim as sanctuary? Go inside your heart. Find the beating, pulsing reality of your interior being. Ask for God to show you Love’s peace, Love’s will, Love’s desire for you this day. Will you join me and the Sisters in prayer? This Sunday, September 13, 2015, from 1-4:30pm, our good friend and Oblate of St. Francis de Sales, Brother Mickey McGrath will be leading a Day of Prayer as part of the celebration of 2015 Year of Consecrated Life. You know Brother Mickey McGrath as the artist who painted the Windsock Visitation which hangs at our monastery and anchors our webpages. 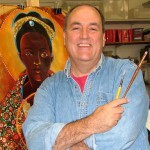 He is as an award-winning artist and author who speaks on the connections between art and faith. This Sunday’s Day of Prayer event is sponsored by the Archdiocese of St. Paul and Minneapolis and local religious. Please join us! All are welcome! WHEN: 1 to 4:30 p.m; Sunday, September 13, 2015. RSVP: Registration is not required, only requested for help with planning. RSVP online. This event is FREE. This event will include a panel response, small group sharing and prayer.